To say that this is a major deal for Austin and Texas is an understatement. Austin was Kelly’s final work that capped off a remarkable 65-year career. 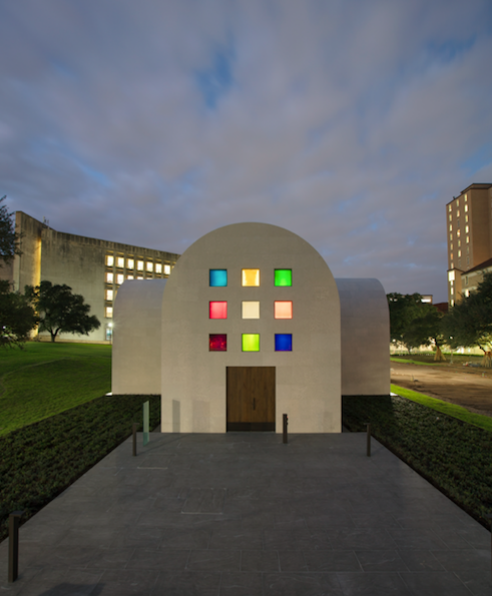 Before touring Austin, we first made our way into the main museum so we could tour Form Into Spirit: Ellsworth Kelly’s Austin. In this tour visitors can learn how the concept began for Austin (during his time in France in the late 40’s and early 50’s), as well as some of Kelly’s (and rarely seen) early work. It also includes the original sketches and concepts of Austin that were made in the mid-80s that culminated to what is now a modern landmark. After exiting the main museum, we walked to the nearby temple-inspired permanent installation located just northwest of the main Blanton Museum building. We were particularly struck by its sophistication, simplicity and color. Before entering the front door, you see the mechanically anchored limestone panels brought in from Alicante, Spain. 1,569 in all. Once inside, the 2,715 square foot masterpiece one feels an immediate sense of Zen and calm. At the opposite end of the front entrance sits a convex totem made from redwood originally logged in the 19th century that was recently recovered from the bottom of a riverbed. After absorbing this awesome space as a whole, you can feel the finer details as you stroll the space. The crisp white walls with coved ceilings. The 14 black and white stone panels that represent the stations of the cross. The white marble being sourced from the same quarry Michelangelo sourced his marble and the black sourced from Belgium. The most inspiring parts of the installation are the 33 individual (32 of which are colored) windows on the south, east and west sides of the building. These facades are in three unique designs: color-grid, starburst and tumbling squares. What makes adding the color patterns so unique is that the sun shines through the windows allowing the stone pieces to be covered with colors at various points throughout the day. Even better, since the sun changes position throughout the year, the colors will beam brightly onto the different pieces of art and parts of the building based on the time of year you go. Which makes this is a place to visit more than once to be inspired.